I wish I could tell you that working with a leadership coach will help you to stop the “noise” that is created in your work environment but this is something I cannot promise. Negative people will always be there. Unfair treatment will continue to show up. You may meet rude people who try to put you down. People who want to be right at all times may test your patience. Difficult personal situations may keep you up at night. You will feel stressed and overwhelmed at times. Managers who never have a word of appreciation and recognition can leave you feel discouraged and demotivated. Take it for what it is. Life. Learn to handle life’s challenges in a more meaningful way. Life is not what happens to you, it is all about how you choose to experience it. The actual situation is only 10%, 90% is how you respond to it. Every day you have to work at it, so that outside circumstances cannot take your peace away. Make the decision to make it a great day – it is all about being joyful and happy. Become aware of your inner dialogue – what are you telling yourself when life seems to be unsettling? Do you feel like a failure (fixed mindset) or do you see it as a challenge (growth mindset)? A difficult day doesn’t mean a difficult life – find the good in every situation. Do you take full responsibility for your life? Develop mental strength – what doesn’t kill you will make you stronger. Nobody can create change for you. You have to put in the work to see things happening. Are you busy complaining or are you busy creating a life strategy? Take a deep breath and use that pause to make different choices – different choices will bring you different results. Don’t be a victim, aim to be a victor. 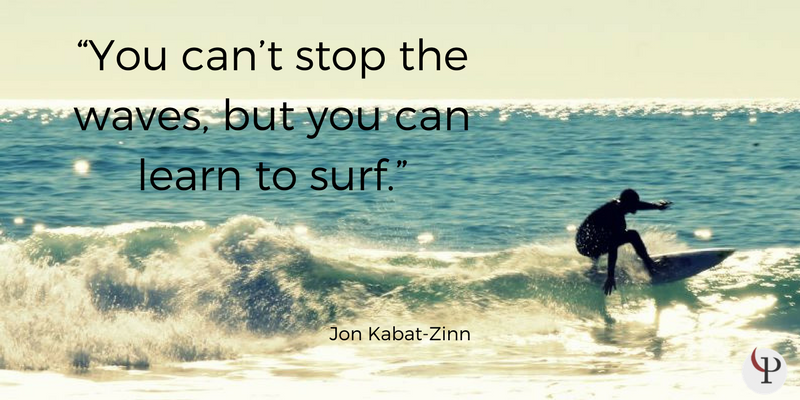 If you appreciate the waves, you will have fun on the surfboard.